Jiu-jitsu.News: Ievgen Skyrda: The whole life is a battle! During recent years the Brazilian jiu-jitsu has been gaining rapid popularity in Ukraine. 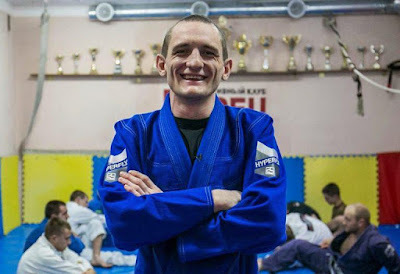 The jiu-jitsu coach from the Kropivnitskiy city (Ukraine) Ievgen Skyrda is one of the ideologists of this relatively new kind of sport for Ukraine. Ievgen has already trained the European champion and three world champions over the past three years. He is going to create Kropivnitskiy BJJ academy where 500 children will be able to train. Ievgen Skyrda has been being engaged in sport during all his life. Today he successfully trains children and adults who take top places at the international championships. Ievgen gradually develops and popularizes BJJ in his native city and his fighters glorify Ukraine on the world sport arena. The coach doesn’t hesitate answering the question how does he see himself and his academy in the nearest 5 years? “The first stage for me is to train IBJJF black belts who will become the world champions in Brazilian jiu-jitsu. I am not interested in any other versions. If you want to be the best one in the BJJ you must win the World IBJJF Championship”. The World IBJJF Championship is held annually in Los Angeles and gathers top fighters from all over the world. This is an open championship thus anyone can take part and compete for the gold. There aren’t qualifying fights therefore any fighter can apply for the participation but only the best ones can reach semifinal and final games. According to Ievgen, the IBJJF is only prestige. But for example if the fighter has IBJJF black belt he will never have problems with money. He will have sponsors, seminars and etc. There are a lot of examples when world champions are sitting pretty. For example Mendes brothers who are 25 and 26 years old now. Both of them already have their own houses on the coast of Los Angeles. They travel around the world and their seminars are scheduled for the year ahead. In addition, brothers have sponsors (brands of sport goods) which pay them. Moreover, over the past years there are many commercial tournaments where fighters receive money for the victories. For instance, this is Abu Dhabi World Professional Jiu-Jitsu Championship. Tens of thousands of dollars are put skin in games of black belt division. If you gain the top position in the IBJJF ranking you will get 40 thousand dollars in the end of the year. Thus fighters receive perfect financial motivation to reach top positions. Ievgen Skyrda doesn’t give his fighters some slack. It is because couch wants his fighters to turn favorite sport, hobby into profitable business. Ievgen noted that he has become picky and doesn’t feel flush of victory as it was before. “Currently, I consider any competition as intermediate and preparatory stage to the World Championship. Therefore, now I analyze performances of my fighters deeper. I try to explain them what they do right or wrong because it helps to develop their skills”.